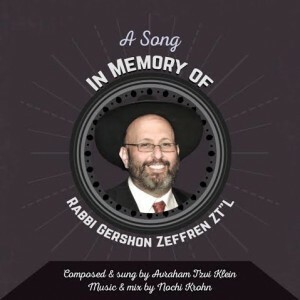 When I sat down to write this song about my dear Rebbe and mentor, Rabbi Gershon Zeffren ZT”L, I thought to myself “How on earth am I going to express my feelings about my Rebbe in one song?”. I then realized that it is impossible. I made it my goal when writing this song that it should give encouragement and inspiration to his family and to all those who knew him. I am also hoping that those who did not have the opportunity to meet him will be able to at least get a small understanding of who this great man was. This song should be a zechus (merit) for an aliyas neshama (elevation of the soul) for Rav Gershon Yitzchok ben Yoel Eliezer ZT”L. I know he would be proud that we are striving to continue in his ways which are the ways of Hashem.